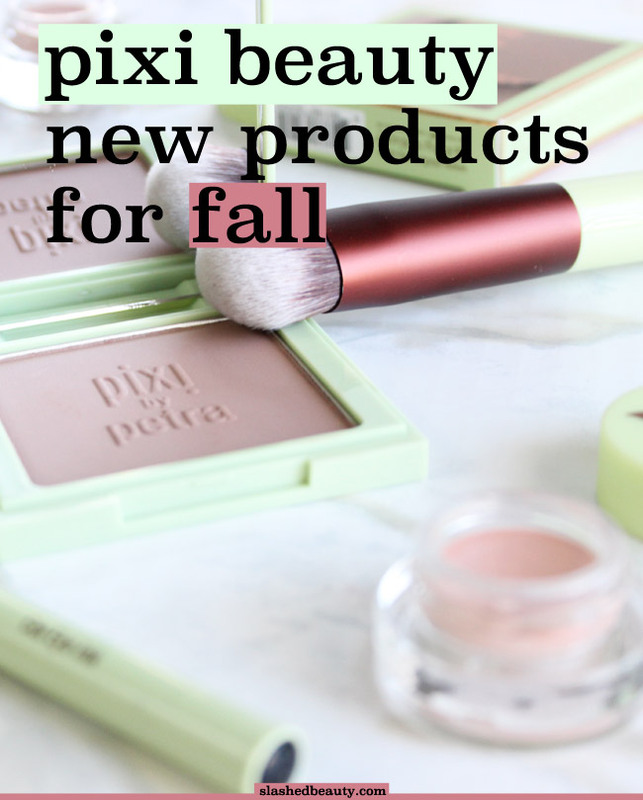 Drugstore mid-range brand, Pixi Beauty, has been churning out some really cool new releases lately that have been making their way into my routine this fall. I’ve personally noticed at my local target that the brand has been getting more real estate in-store, which is exciting since the line will be more accessible than ever now. One of my favorites of the new Pixi Beauty fall releases is the Natural Contour Powder ($20) in the shade Shape & Shadow. It’s truly the perfect shade for adding dimension to light and medium skin tones as it’s both matte and cool toned to emulate shadows. The formula is incredibly smooth and it blends out beautifully for a really naturally looking contour. It is a little sheer at first, but builds up pretty quickly with layering if you want something a little more dramatic. 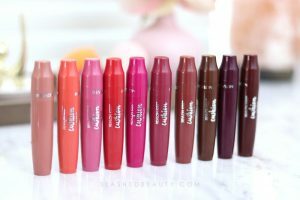 I was totally stoked when I saw that Pixi released their first lipstick line, the Mattelustre lipsticks ($12). The name does throw me off because the finish does have quite a bit of shine to it, but either way, they are creamy and long lasting. You get what you see in terms of pigmentation: they apply just like how they look in the tube and have good staying power despite their glossiness. The darker shades, like Plum Berry (left) leave behind a slight stain. The shade on the right is Pure Fuchsia, which I’ll probably be saving until Spring since I’m all about the vampy shades this season. 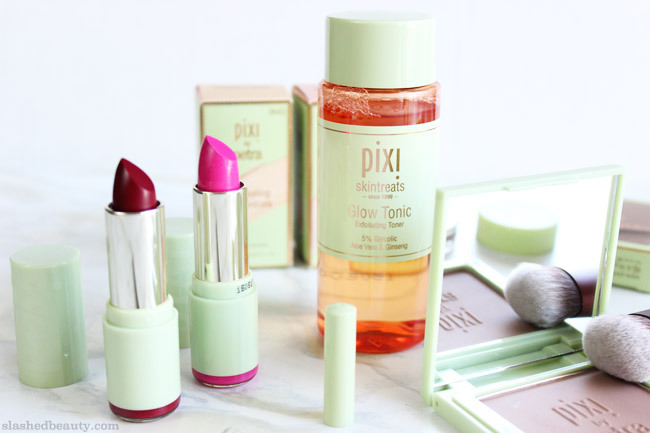 I’ve reviewed the Pixi Glow Tonic in depth here, but the brand has decided to put out a smaller bottle at half the cost ($15)! This is great if you’re noncommittal and just want to see if the cult favorite works for you without putting down thirty bucks. It also makes traveling a heck of a lot easier, being TSA friendly. I’m already a fan of their brow palette, but the new Endless Brow Gel Pen ($11) has been perfect for my busy days, being waterproof. I’ve been using the shade Medium, which is a cool, ash brown that mimics hairs very well. Despite being a pencil, it’s not too soft so you have control as far as if you want your brows to look super defined or naturally fuller. Last but certainly not least is their new Cat Eye Ink eyeliner ($14). I’ll be honest, this one had to seriously grow on me but once it did, I was hooked! It’s a felt tip pen liner that has an elongated and narrow slanted tip which helps precisely apply your lines, both thick and thin. The formula comes out really wet at first, and looked streaky on my first application. Instead of just writing it off, I gave it a week and found that it seemed to become more intense and smooth as time went on. I still layer it to get the black to look really opaque, but I like it for a quick cat eye. I find that it works best over shadow/primer, which will make it set quickly and last all day. 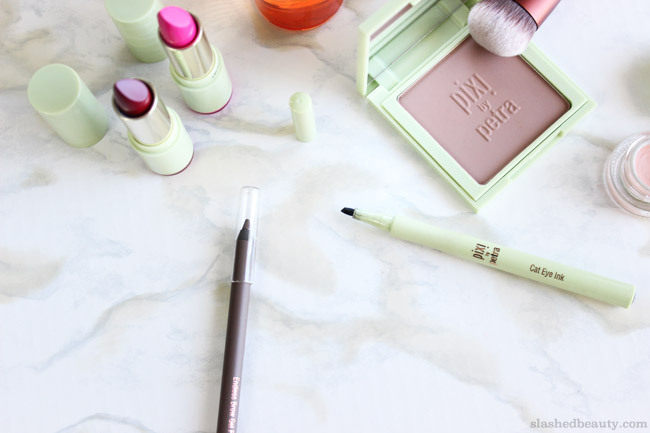 While Pixi does have higher prices on the drugstore spectrum, I’ve never been let down by the quality of the products or the packaging, which is elegant, space efficient and sturdy. Find them at your local Target! I am loving all of their stuff too. Amazing. I’ve always wanted to try the glow tonic. I love the glow tonic and I’m so glad Target carries it now. I love this line. I just got my 20% off sale order in the mail today. I stocked up on the brow gel pencil and bought some Shea Butter Lip Balm. I use the Glow Tonic everyday. I wish my Target did a better job of stocking the display. I must pick up some of these things I’m seeing everywhere, soon. Especially that Glow Tonic. That Glow Tonic has been everywhere! I think it’s a sign I need it in my life. I haven’t used this brand. The products look pretty decent. 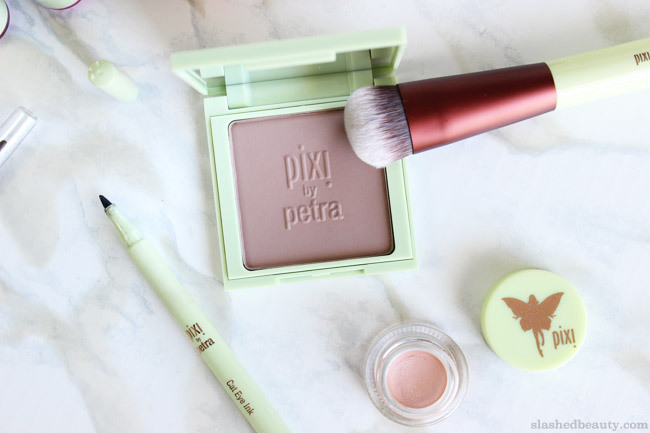 I’m not usually a fan of Pixi, but the contour powder sounds promising. The lipsticks look really pretty. I really like the look of that brush and the contour powder! I’ve finally been able to try the Glow Tonic, and I see what all the fuss is about. It’s good stuff! I am loving the new ELF goodies, and so impressed with those lipsticks! Girl you know I can’t do more than one thing at a time heheh I love Pixi’s new lustre lipsticks heheh I was also impressed with their bronzer! I want to try the Glow Tonic as well. 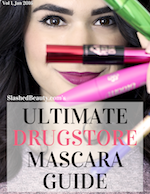 I have been seeing rave reviews about it everywhere! It did really well at fading my acne hyperpigmentation quickly!